A series of deadly attacks in Bangladesh has raised alarm in the country and abroad - and there is little clarity on who is behind the violence. 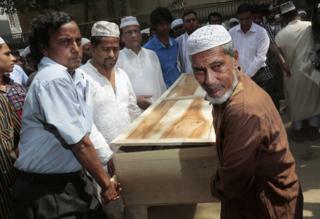 BBC Bengali's Akbar Hossain examines the key questions behind the killings. How many people have been murdered? More than 20 people - including secular writers and bloggers, professors, members of religious minorities and two foreigners - have been killed in attacks blamed on Islamist militants since 2013. The killing of three people in two days in late April has heightened fears that the violence is escalating. The murders of two foreigners - an Italian and a Japanese man - last October, added a new dimension and more security questions. In many of the attacks, victims have been hacked to death with machetes, and in some cases beheaded. It appears so. Initially, secular and atheist bloggers and writers were targeted. But now the militants seem to be widening their list of targets. A university professor killed on 23 April was not an atheist, but involved with cultural activities which many hardline groups condemn as "un-Islamic". This view reflects increasing radicalisation in Bangladesh, a secular Muslim-majority country where many show no sympathy for those perceived to be against their religion, even if that perception is without foundation. The killing of a gay rights activist and his friend in Dhaka the day after the professor was murdered is seen as further evidence that the militants are broadening their list of targets. That remains murky - Bangladesh has myriad extremist groups. The government has disputed claims by so-called Islamic State or al Qaeda-linked groups for the attacks, instead often blaming opposition parties or local Islamist groups it accuses of seeking to destabilise the country. These claims have been denied by the opposition. After the killing of the LGBT magazine editor on 25 April, Prime Minister Sheikh Hasina said opposition parties "are involved with these secret killings as they want to destabilise the government and the country". The attacks on Italian aid worker Cesare Tavella and Japanese farmer Kunio Hoshi last autumn were similar in style and reportedly claimed by IS. But while the government says there is no organisational presence of IS in Bangladesh, many analysts say that matters little - because there are many local extremist groups which share the same ideology. Former Army Brigadier General Shakhawat Hossain, now a security analyst, said last year: "Every underground [Islamist] outfit has some sort of interconnection because they share the same ideology. "But I'm not sure whether Islamic State has any link to the foreigner murders." Have the police caught any attackers? Four secular bloggers were hacked to death in Bangladesh last year, with each murder putting the spotlight on the government. In October attackers attempted to slit the throat of a Christian pastor in Bangladesh's northern region. Police arrested five members of a banned Islamist group, Jamaat-ul Mujahideen, for the attempted murder. And a religious instructor in the Sufi strand of Islam - also known as a pir - was slaughtered at his home in Dhaka. But despite the lengthening list of victims the police have made little progress relating to the investigations. In only one case - the murder of blogger Ahmed Rajib Haider in 2013 - has anyone been convicted. But no one has been punished for the other killings. In fact in many cases the police have been unable to identify the culprits. For instance, it has been more than a year since writer Avijit Roy was hacked to death. But no one has been convicted. Many analysts believe the police are not taking the investigation seriously because of Ms Hasina's comments, which include criticism of the atheist bloggers. Last week, she issued a stern warning to anyone who criticised religion, saying: "I don't consider such writings as freethinking but filthy words. Why would anyone write such words? It's not at all acceptable if anyone writes against our prophet or other religions." The opposition say her accusations against them and the bloggers have hampered a credible investigation.